A man whose horse was found severely exhausted and dehydrated has been jailed for "neglecting" the animal. RSPCA inspectors spotted the cob gelding breathing heavily and dripping with sweat at the Appleby Horse Fair in June 2017, and struggling badly again the following day. 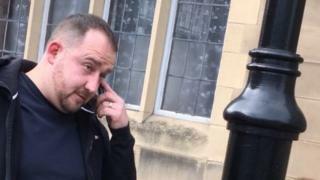 Horse trader Robert Hunter, 34, admitted two counts of causing unnecessary suffering. Hunter was jailed for 90 days by magistrates in Carlisle. The court heard Hunter, had only allowed the horse to be examined by a vet after police intervened. The vet found the animal was severely exhausted, had a dangerously raised heart rate and was dehydrated, and without treatment would have been at serious risk of collapse and, subsequently, death. Following treatment, the animal made a full recovery. Hunter admitted two counts of causing unnecessary suffering to a protected animal, both by overworking the horse and failing to provide it with routine dentistry. The married father of four and "experienced horseman" said of the family pet: "I would never ever cause that horse any unnecessary suffering that I'd have known of." However, District Judge Gerald Chalk said: "Put simply, that horse had been severely overworked and was suffering from dehydration. "That, in my view, is either deliberate ill treatment or neglect by you, and a high level of suffering was caused to that animal." Hunter was also banned from owning or keeping any equine animals for six years.